The sea route of south Arousa involves a journey of around three hours until disembarking in Pontecesures. The departure point is the point of O Grove, from the piers of Pedras Negras and the village of O Grove. The two routes unite in front of Cambados, and these in turn, join with the route from Ribeira opposite the Island of Cortegada. The maritime route from Pedras Negras, with the isle of Ons at the bow of the ship, passes by a handful of islands until the beach of O Carreiro comes into view, sandy where the necropolis of Ardo Velo is situated. At this archaeological site one of the most revealing remains from the sea crossing of the apostle Santiago was found: a coin from the XII century with the image of the corpse of Santiago aboard the apostolic ship navigated by his two disciples Athanasius and Theodore. The voyage continues with the peninsular of O Grove to the starboard until reaching the main port of the town. From there it is also possible to begin the pilgrimage by boat, in this case, from the island of La Toja. 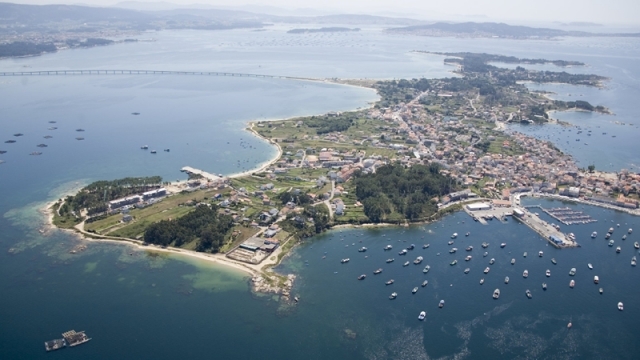 Hardly a mile to the north, the two routes converge, level with the port of Cambados, a town that boasts one of the best conserved historic centres in Galicia. Now continuing the same route, the navigation proceeds to the islands of Arousa and Vilanova, passing under the bridge that connects the islands to the PO-307 road. The port leaves pilgrims in the natural area of O Carreirón, a recommended place to visit. (The island of Arousa and the access bridge. After passing below the bridge Vilanova of Arousa, close to Vilagarcía of Arousa, where the northern route (from Ribeira) and the southern route (O Grove) join, pilgrims border the Island of Cortegada. If the route is taken close to the river mouth then Rianxo can be seen. This area is one of the richest in shellfish in Galicia. The boat enters the river. The channel narrows. There are poles to mark the riverside route. The remains of the towers of the east are reached, a fortress constructed in Catoria during the Middle Ages to defend Compostela from the Vikings. The Camino continues peacefully along the river. The route is well marked. Passing through the island of Bexo, reaching the influent river Sar, which starts in Santiago of Compostela and crosses Padron. Little remains to complete the voyage. It ends quickly in Pontecesures. From there it is possible complete the journey to Santiago on foot.